Traverse Bay Manufacturing Inc., a family-owned textile products business, has been in operation serving clients in both Canada and the United States since 1990. 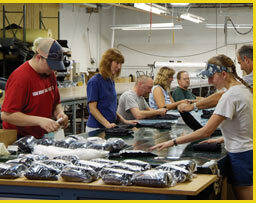 After perfecting our own product line we began to manufacture clothing and bags for retailers including L.L. Bean, Land’s End, Patagonia and Cabela’s. Our client base has recently expanded to include the governmental sector. Over the years, we have doubled our production space and added the latest technology from Gerber, a world leader in pattern design and cutting equipment.